Pan-frying wild salmon is like an homage to the simple cooking style of the fisherman eating it right on the boat. When pan-frying it, it’s important to remember that wild salmon tends to be much leaner than farmed salmon because it is allowed to live out its entire migratory journey rather than being stuck in a feedlot. 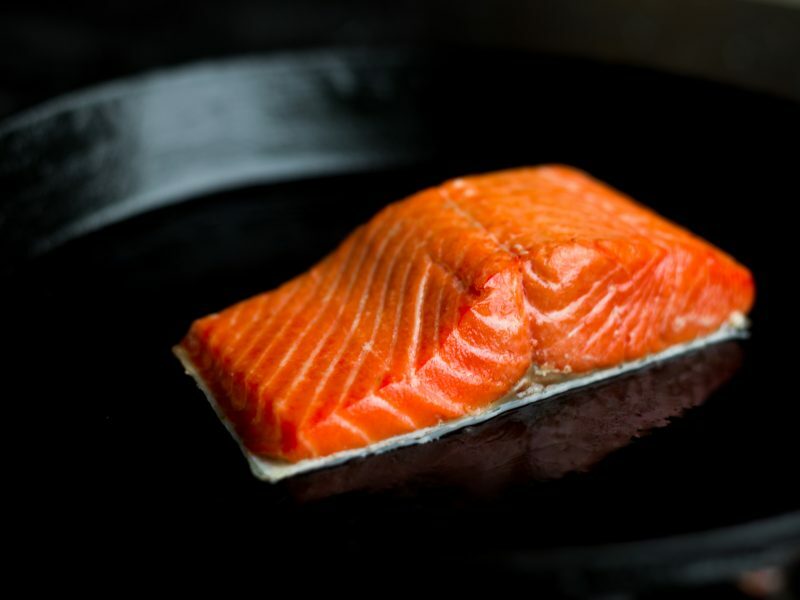 Because there is less fat in wild salmon, it will cook faster than its farmed counterpart. The first step is removing any excess water from the fish with a paper towel or a clean kitchen towel. Next, you will have to choose a skillet. Cast iron skillets are a good choice, but a skillet of any kind will do. After you’ve removed the moisture from the fillets, season them well with salt and pepper — especially the skin side. Remember, you don’t want to overcook your fillets. A good tip to mitigate overcooking is to bring the fish to room temperature before you begin cooking it. If you cook salmon right out of the fridge, the outside can become charred while the inside remains undercooked. 3) Once the pan and oil are hot, place fillet flesh side down for about 1.5 min - your flame should be at about a medium. 4) Flip it to skin side down, lower heat to medium-low, and do not move until finished cooking so the skin gets nice and crispy. 5) Season with more salt and pepper. 6) Let it cook for about an additional 7-8 min depending on how thick your piece is. Total cook time ends up being about 8-9 min. 5) Serve skin side up, so you don’t get that skin you’ve worked to crisp all soggy. If you’re looking for freshness and simplicity, look no further than this pan-seared lemon thyme recipe, which is as simple as it is delicious. Another great recipe option to pan-fry wild salmon involves dill, a flavorful herb that many see as the perfect compliment to salmon. Check out this pan-seared salmon with dill butter recipe for an easy execution.